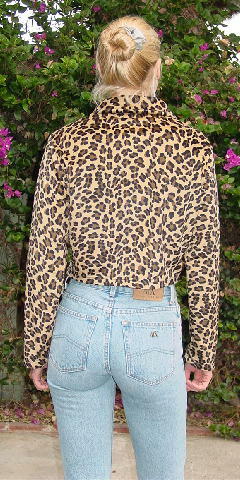 This fabric jacket has a tan background with a medium brown and black cheetah print. It has long sleeves, a full front zipper, and is lightweight. It belonged to a Miami model who wore it with skirts, pants, jeans, and shorts. shoulder to hem 17 1/2"